The HP LaserJet Pro M1217NFW is a midrange monochrome multifunction laser printer with copy, scan, and fax functionality in addition to standard print feature. 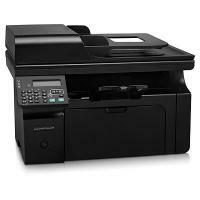 This printer is an ideal choice for small office as it offers good printing speed and networking features. However, this printer is not a good choice for large business that requires large volume printing as it yields high cost per page due to expensive HP LaserJet Pro M1217NFW toner cartridges. The all-black device has a conventional look with a 35 sheet ADF on top of a flatbed scanner. The 150 sheet input tray folds down from the front panel and the output tray sits just beneath the scanner bed. The LaserJet Pro M1217NFW's control panel is small about 6 x 4 inches. This little space is home to just over 20 buttons, three LED indicators (Ready, Attention, and Toner Status) , a fax number pad and a two-line by 16-character LCD display. The device is environment-friendly, integrating instant-on technology, instant-on copy and auto on/off mode into one single machine. The print speed of this printer is up to 19 ppm. The fax feature in HP LaserJet Pro M1217NFW comes with an auto redial, an answering machine, a PC faxing feature, and a junk fax barrier, and transfers messages at a speed up to 33.6 Kbps. Supports Apple’s AirPrint and HP ePrint. The HP LaserJet Pro M1217NFW toner provides good quality prints, scans, and copies at respectable speeds. Small offices searching for a light to moderate output needs in a small space should find HP LaserJet Pro M1217NFW a good fit. However, its relatively high cost per page and lack of an automatic duplexer makes it less efficient for large business workplaces. How to get better prints from your HP Laserjet Pro M1217NFW printer? If your HP Laserjet Pro M1217NFW toner cartridges have dried out or found defective or may be the print density is too high, then it may result in several print quality issues like dark backgrounds, smeared prints or printed pages with misformed characters. The amount of background toner shading becomes unacceptable. The paper might not meet HP specifications. Use a different high-quality paper with a lighter basis weight . The print-density setting is too high. Decrease the print-density setting. This decreases the amount of background shading. Very dry (low humidity) conditions can increase the amount of background shading. Check the product environment to meet the specific conditions. The HP Laserjet Pro M1217NFW toner cartridges might be defective or low. Replace the print cartridge in such case. The toner smears easily when touched. The product is not set to print on the type of paper on which you want to print. In the printer driver, select the Paper/Quality tab and set Paper Type to match the type of paper on which you are printing. Print speed might be slower if you are using heavy paper. The paper might not meet HP specifications. Use the paper that is recommended to meet the HP specifications. The HP Laserjet Pro M1217NFW toner cartridges might found faulty. Replace the print cartridges if it results in smeared prints. The paper path might need cleaning. Clean the paper path and check it again. The power source might be defective. Plug the product directly into an AC outlet instead of into a power strip. The fuser temperature might be too low. In the printer driver, make sure the appropriate paper type is selected to prevent toner smear. The printed page contains misformed characters. The the paper might not meet the HP specifications. Use a different paper, such as high-quality paper that is intended for laser printers. If characters are incorrectly formed so that they produce a wavy effect, the laser scanner might need service. Verify that the problem also occurs on the configuration page. If so, contact HP or the support flyer that came in the product box. Q. Do HP Laserjet Pro M1217NFW toner cartridges print only in black or in colour as well? A. These cartridges are designed to print only in black. Q. I’ve been noticing streaks on the pages that I’ve been printing of late (I use a HP Laserjet Pro M1217NFW printer). Is there any problem with my printer? Can it be fixed easily? A. No, there seems to be no problem with your printer as such; streaks usually appear when it’s time to replace toner cartridges so if you’ve been using the current one since a long time and it’s about to be exhausted, it will be helpful if you change it. Q. Are compatible HP Laserjet Pro M1217NFW toner cartridges that you provide, able to print very clear and sharp images? I have to print a lot of images and graphics for my work these days, so I’m considering using a compatible version of these cartridges. A. Yes, these compatible toner cartridges contain ISO standard ink, which guarantees professional quality sharp and crisp output every time you print with them. Q. I’ve been using HP Laserjet Pro M1217NFW toner cartridges for more than a year. However, I noticed that the number of pages printed this time was lesser than before. Does it mean that the volume of ink in compatible cartridges is not the same? A. No, the volume of ink in toner cartridges does not differ. The number of pages printed by cartridges tends to vary a bit as it depends on the type of content printed. Printing images consume more ink/toner powder than printing text documents, so you might have printed more images this time around due to which your cartridge is exhausted earlier. Q. Can I really print more than 1,500 pages with your compatible HP Laserjet Pro M1217NFW toner cartridges? A. Yes; in fact, these toner cartridges print up to 1,600 pages without requiring the ink to be refilled repeatedly. Q. Is it necessary to use USB cable to connect to this printer? A. Yes, it is one of the drawback of this printer that the USB cable must be purchased separately to connect to this printer. Q. I'm using HP Laserjet Pro M1217NFW printer. At some point, the printer stopped printing wirelessly. Though the wireless network works fine, I’m unable to print wirelessly. Please suggest me a solution. When an Ethernet cable is connected to the printer, the printer cannot connect wirelessly. Q. What is the ink volume of HP Laserjet Pro M1217NFW toner cartridges you sell on this site? A. The ink volume for these cartridges is 1600 pages per toner. Q.Does the printer supports HP ePrint and Apple Airprint? A. Yes, the printer supports HP ePrint and Apple Airprint. Q. Why does my HP Laserjet Pro M1217NFW printer rejects the HP Laserjet Pro M1217NFW toner cartridges I’m using? Plug the printer back in it. Even after following these steps, if the printer rejects the toner cartridge than it might be possible that the toner cartridge you are using is faulty. You can replace this faulty toner cartridge with the HP Laserjet Pro M1217NFW toner cartridges available at https://printerinkcartridges.ie/hp-inkjet-cartridges/hp-laserjet-printers/hp-laserjet-pro/laserjet-pro-m1217nfw. These cartridges will cost you much lower than the original ones, producing good quality results. Q. How is the HP Laserjet Pro M1217NFW printer well-known for its value-for-money printer? A. The printer is well-known as value-for-money printer because of its features like easy to set up, good network feature, integrated automatic document feeder and decent print speed. Q. What should i do if the printer is not communicating with the wireless router or access point? Verify that the wireless light is switch on. If it is not on then press the wireless button. Move the product closer to the wireless router or access point, and then try again. Restore the default wireless settings. You can also refer the user manual for this. If the error still persists, uninstall the product, and then re-run the installer program. When prompted for network settings, provide the settings, and then continue with the installation. Q. The product i was using ran out of toner while printing a fax. What should i do now? A. The product stores the recently used printed fax. The amount of memory available determines the actual number of faxes stored for reprinting. If possible, replace the old HP Laserjet Pro M1217NFW toner cartridges with the new ones and then reprint the fax. This would probably resolve the issue. Q. The toner light is on. What does it indicates? A. When you get such condition, it means that the print cartridge has reached the end of its estimated useful life. When the supply has reached this condition, this means that the premium protection warranty for that supply has ended. You do not need to replace the HP Laserjet Pro M1217NFW toner cartridges at this time, and should wait unless the print quality is no longer acceptable. Q. How to Clear jams from the output areas of the printer? A. While clearing the jams keep in mind to not use the sharp objects, such as tweezers or needle-nose pliers, to remove jams. As damage caused by such objects will not be covered under the warranty. Lift the scanner unit assembly, and open the print-cartridge door. Remove the HP Laserjet Pro M1217NFW toner cartridges carefully. Keep the print cartridge door open, and then with both hands, grasp the side of the jammed media that is most visible. Carefully pull it off from the product. Install the toner cartridges back to their place. Close the print-cartridge door and the scanner assembly. Q. Can you tell me the supported “Windows” operating systems for the HP Laserjet Pro M1217NFW printer? Q. How many copies can I get from the HP Laserjet Pro M1217NFW toner cartridge? A. The estimated page yield for HP Laserjet Pro M1217NFW toner cartridge is 1600 pages which is based on printing 5% coverage on an A4 page. If you print more than 5% than the page yield will decrease accordingly. Q. Can you tell me the price of the compatible HP Laserjet Pro M1217NFW toner cartridge in USD? A. Unfortunately, we deliver these HP Laserjet Pro M1217NFW toner cartridges only to addresses within Rep.Ireland & Northern Ireland. So, we would not be able to provide the price of these cartridges in USD. Q. Is there a way I can print watermark on each of the page with the HP Laserjet Pro M1217NFW printer? This will add the watermark on all pages. In case you want to print the watermark only on the first page, click the First Page Only check box. Q. Are the HP Laserjet Pro M1217NFW (CE285A) toner cartridges same as for Hp Laserjet Pro P1102 and P1108? A. Yes, The HP Laserjet Pro M1217NFW toner cartridges are same as used in the HP Laserjet Pro P1102 and P1108 printer models and work perfectly fine with them. You can also refer to the printer page to find all their compatible cartridges. Q. Recently my HP Laserjet Pro M1217NFW printer has started printing Grainy and faint printouts. The paper type that I am using is correct and it matches the printer settings as recommended by HP itself. The toner cartridge is also newly inserted. What can be causing the bad print? How should I resolve it? A. Faint and grainy printouts can be caused due to low ink levels or there is some clogging in the printheads. But in this case when the toner cartridge is new, the poor print quality may be appearing due to the dirty print head. To begin with, use a nozzle check utility to make sure that the print head is not clean. It will help save ink in the new HP Laserjet Pro M1217NFW toner cartridge. Then open the printer software from the taskbar and go to Head Cleaning option. Follow the instructions on the screen. You will see the light flashing during the cleaning cycle. It is recommended that you use the printer in every two to three days. This will stop the HP Laserjet Pro M1217NFW cartridge from clogging the print head nozzles. Q. Are there any colour cartridges available for the HP Laserjet Pro M1217NFW printer? Or it can print only in black and white. A. No, there are no colour cartridges available for your HP Laserjet Pro M1217NFW printer model. The HP Laserjet Pro M1217NFW printer is a monochrome laser printer which can only print in black, no colour cartridge will work with it. All the compatible cartridges that will work with HP Laserjet Pro M1217NFW printer are listed above on this page.